Toys R Us started with an exclusive on all Jazwares figures, however the exclusive expired in 2010. (BigBad Toy Store has them now 2010, at a lower mark-up than all other online retail. If your TRU isn't stocking the figures, this, OR Suncoast Video Stores (in malls) may be the best place to get them. ForbiddenPlanet UK has added the figures too! They're 5.99 pound. Info by Dio Soth & Fuzzball Raccoon. These are the earliest painted shots of the third small line 3.5 inch figures from Jazwares. 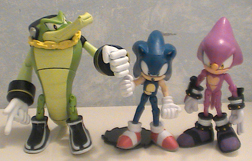 The line starts off super strong with great sculpts for Espio, Vector, Super Shadow and a REAL Super Sonic. 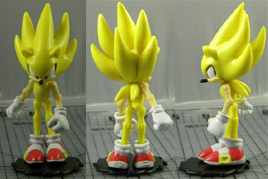 All these shots are by Jazwares themselves, and were taken pre-approval by Sega, but it is highly likely that the final figures will look exactly the same. There isn't really much fault to find here, with great paint jobs all around, and the Chaotix members looking just like they should. Just look at all the detail on Espio! From 'ninja wrapped' socks to his detailed glove cuffs, he's a winner for sure! One small paint anomaly here could be that Espio's back spike isn't green, but it could change. Vector will be at least 4 inches high, so they ARE paying attention to scale for these guys now. 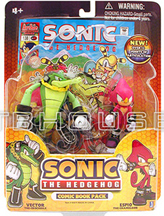 It is expected that Vector & Espio will be released in a comic 2 pack. Notice also that they both have 'waist' joints as well. 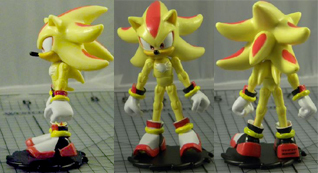 They paid attention to Super Shadow's more cream/platinum tone color rather than yellow/yellow, and Super Sonic is appropriatly bright, with red eyes and actual 'super' spikes. 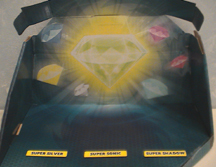 The Super figures are expected to come in a pack with 7 Chaos Emeralds! 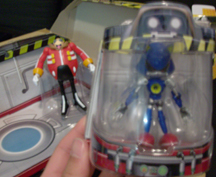 Here's the latest & greatest 2 pack from Jazwares yet. Instead of having a comic everyone already owns, this one has a rather awesome "Diorama Style Box" complete with removable, re-useable pod. 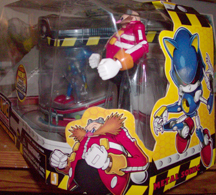 The box depicts Eggmans' lair (reminiscent of Sonic Adventure 1, where you could find it, and Metal Sonic in a pod) With great art all over, caution striping, and die cuts, this box spares nothing in the quest to be cool. 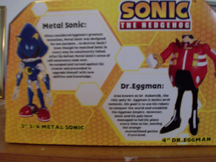 The back (above) even has cool profile write-ups of Metal Sonic & Eggman for you to read. Once the box is open, you have a scene that you can use the figures in! 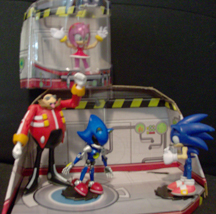 Look, Amy is trapped in the pod, while Eggman sends Metal Sonic against Sonic. Just think about it on your shelf today! This should retail for $12.99 at Toys R Us. With this turn-around below you can see eggman not only looks great, he poses well too. He doesn't need a base to stand, as his feet are so big. His joints are also sturdy enough to support him. He has great face detail (looks evil!) and his pants & shirt are well painted and have all the detail from the games. His head, wrists, and hips can twist. He has no 'middle joint' like all of the other figures do, but you also don't really miss it. He can bend at the hip, knee, elbow & shoulder. 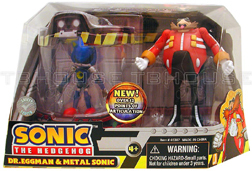 This is a great figure, and it's fantastic to finally be able to add another Eggman! Here are the first shots of these figures out of the box. 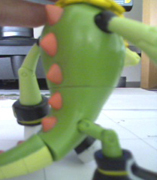 Vector has an extra joint in his tail, that lets him rotate the end of it, which is a nice touch. 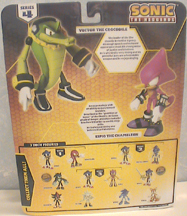 Both figures look good, but watch out for Espio! He can have messy paint. 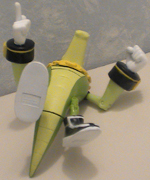 Vector actually has an extra joint, more than those of other figures. You can twist him at the middle, neck, and tail tip. His necklace covers the neck joint, and looks great at the same time. The chain does not have actual holes in it, due to his small scale. His wrists can twist at the back cuff, not at the hand. He's easy to stand (without a stand) as his feet are so large, and also his tail is almost always touching the ground. His joints are all stiff enough that you should be able to pose him however you want. The bottoms of his shoes are also blank/white. With this size comparison, you can see they're paying more attention to scale with these guys. Vector is LARGE and Espio is no small matter either. Their pack actually appears larger on the shelf too. 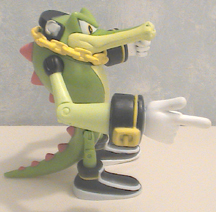 Vector's pose-ability is limited by short legs, but he feels really solid & quality, and has good joints. 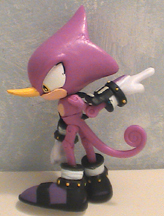 Espio has the above-mentioned joint problems, but should at least stand up for you, and pose well too. The bottom line: GET this set! 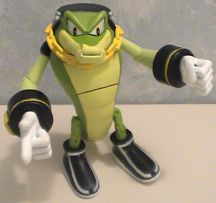 The great sculpting is so well done and accurate & it's great to finally get Chaotix figures! His tail can't rotate, and his shoe-bottoms are just blank/white. Those are only minor things though, and it doesn't really affect his play or display value. His ninja-posed (2 fingers) hand adds character. However, as seen above this figure CAN have problems, such as NO STOPS at all on his elbows, so they go 180 degrees. 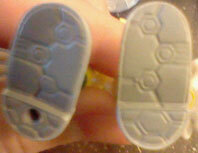 (the 'stop' is the little plastic corner that you'll see on most figures) You can't detect this in the package. They're also trying to 'self-shade' his eye-corners by adding a black rim. The box back does not have profiles, but it does have nice stock-art for everybody. Box back photo discovered by Psyic Ninja Bat. The box itself displays everybody pretty well, with the emeralds 'floating' in the background. Silver's shoes are noticibly different between his regular and super forms. His shoes don't actually change color in-game, so it must be some sort of figure error. Notice the color difference in the below photo, & that the bottoms are NOT colored. 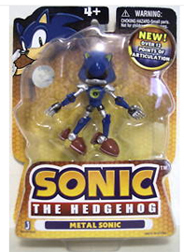 The first REAL Super Sonic figure! 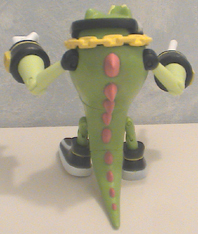 His spikes have all been appropriatly re-sculpted to be much more vertical, as they should be. 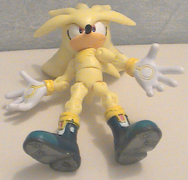 He has the red eyes, and is slightly taller than regular Sonic. For some reason they've decided to self-shade him by adding a black line at the edge of his eye, which he does not actually have. It's mis-enterperated from the stock-art. Watch the figure, as it can be mis-placed on some of them. With these photos you can compare the heights of the figures & their super forms, as well as get a good idea of the size of the chaos emeralds they come with. The emeralds are solid, hard rubber with many realistic facets. They're well made (you're not boing to break these!) and feel heavy. The solid quality and many facets make them look like the real emeralds! The above left photo compares them with the Toy Island emeralds (the only other previously released chaos emeralds) which were very hard plastic, but hollow inside. Despite the TI figures being larger, those emeralds were actually smaller. Why aren't they to scale? Because if they were...they'd likely not show off well in the box, and also be a hazard for quick loss if you tried to play with them. Why are they colored wrong? 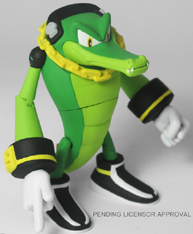 Everyone knows that the orange emerald hasn't been seen since Sonic R. There should be a light blue/cyan-tone emerald, NOT that dark yellow one. WILL this mistake be corrected? If you look closely at the box above, you'll see they're correctly colored there! Also, in their Super Pack Box Mock-up, they are ALSO correctly colored. Something must have gone wrong in the 11th hour to cause this. As you can see here, almost any of their figures can suffer 180 degree joints in either the knee or elbow. Either the stop is non-existant, or way too small to function. Tails is here because he's released continually, it seems. Despite being single-card quite early on, they continue to release him, and it's these that can have the 180 elbow shown. The box has nice die-cut Super Sonic graphics on the edges, and the back-card...back wall of the box has a graphic of the chaos emeralds. Notice that the graphic gets the colors right, but that the emeralds you actually get are wrong. 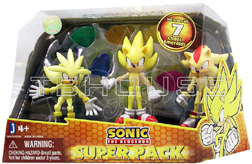 For the Super Hedgehogs 3 Packs sold in 2011, they FIXED the colors of the emeralds. You'll notice the turquoise/blue-green one here right away. Inspect sets before buying! Don't choose old/wrong sets!